Tiger II is the common name of a German heavy tank of the Second World War. The official German designation was Panzerkampfwagen VI Ausf. B and the tank also had the ordnance inventory designation SdKfz 182. 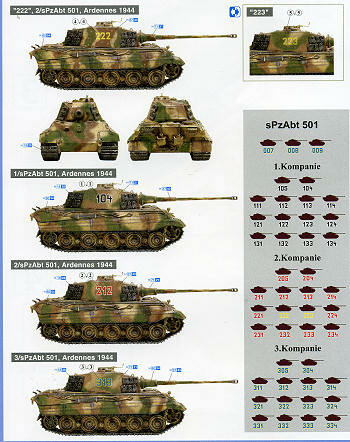 It is also known under the informal name Königstiger (German: King Tiger), and by the British as Royal Tiger. The Tiger II combined the heavy armor of the Tiger I with the sloped armor of the Panther. The design followed the same concept as the Tiger I, but was intended to be even more formidable. The Tiger II chassis supplied the basis for the Jagdtiger turretless tank destroyer. The Tiger II weighed 68.5 (early turret) to 69.8 (production turret) tonnes, was protected by 150 to 180 mm of frontal armor, and was armed with the 88 mm KwK 43 L/71 gun. The very heavy armor and powerful long-range gun gave the Tiger II the advantage against virtually all opposing tanks. This was especially true on the Western Front, where the British and U.S. forces had almost no heavy tanks with which to oppose it. In a defensive position it was difficult to destroy, but offensively it performed with less success. The Tiger II performed very well against Allied and Soviet tanks being able to penetrate the front armour of the M4 Sherman, M26 Pershing and IS-2 at respectively 2500 m, 1800 m and 1200 m. Defensively, the M4 Sherman was unable to penetrate the front even at point blank and the M26 Pershing and IS-2 had to come within 1300 m and 200 m respectively. The Tiger II was widely photographed due to its large size and propaganda value. Here is another neat idea from Dragon Models. This is their very nice King Tiger (Henschel turret) along with 8 Fallschirmjaeger figure in four different poses. The tank kit has been reviewed before and so I'll weasel out and provide a link to that preview for you to refresh your memory on how nice a kit this one really is. 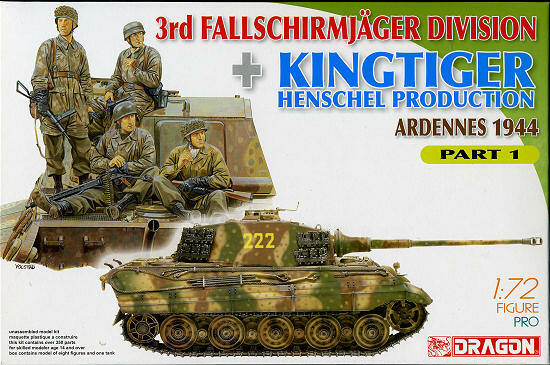 This particular kit does not have the zimmerit of the preview kit and also has the Henschel production turret. It comes with the DS tracks that I have found to be a real boon to those of us who cringe at multi-piece tracks. What's really nice about them, if you have not tried them, is that they hold paint just like standard styrene and are easy to glue with standard cements. What is new to this kit is that it comes with a hull-load of German paratroops. Like the tank on which they ride, the figures are all freshly molded using slide mold technology to provide excellent detail. There are a large number of optional bits and pieces, including a variety of weapons so that you can make each of the eight figures as different as you can. In addition to all that, you get markings to cover every tank operational with sPzAbt 501 that was operational during that time period. It seems that they were all a base of Panzer Yellow with large swaths of Green and Brown painted on them in the ambush scheme with the various colors having contrasting spots on them. Decals are nicely printed and should prove to be no problem at all. So there you have it. A very nice tank model along with a goodly number of figures to adorn it. In all, there are over 350 parts to choose from so this will not be a quickie build. The results of your efforts, however, will be well worth it. Thanks to www.dragonmodelsusa.com for providing the preview kit. Get yours today at your local hobby shop or ask them to order it for you.